1,298 backers pledged $26,556 to help bring this project to life. Huge thanks to everyone that helped make it happen. All funding beyond our goal is now going to the stegoball minigame milestone! Hidden deep within underground sanctuaries, tribes of dinosaurs are able to survive, flourish and evolve throughout the ages. However, new threats of DOOM require those dinos to take to the surface, run for survival and find new places of refuge. Update #5: Stegoball Physics & Art Contest! Customize your dino character with a huge assortment of hats, helmets, skin colors and patterns. Speed across a dynamically-generated prehistoric terrain, 2D platformer-style. No two levels are ever the same and you often have multiple paths to choose from. Outrun a pyroclastic wall of doom that's constantly on your tail. Slip up or stop to admire the scenery and you just might go extinct. Beat the doom wall and find your sanctuary! Attack smaller creatures or gobble plants for energy and skill boosts. Collect hidden super eggs to rack up DNA, used to upgrade your stats between levels. Earn bones and use them to unlock new areas of the game and other perks. Race your friends in multiplayer matches, or just hang out in the lobby and chat. So how is the sequel different? IMPROVED ART STYLE: A fresh coat of pixel-paint on everything, bumping it up to what you might call "modern 16-bit". Click to view a replay of the livestream where we bring this magestic spinosaurus to life! NEW PLAYABLE DINOS: The original had a single raptor as the only playable character. 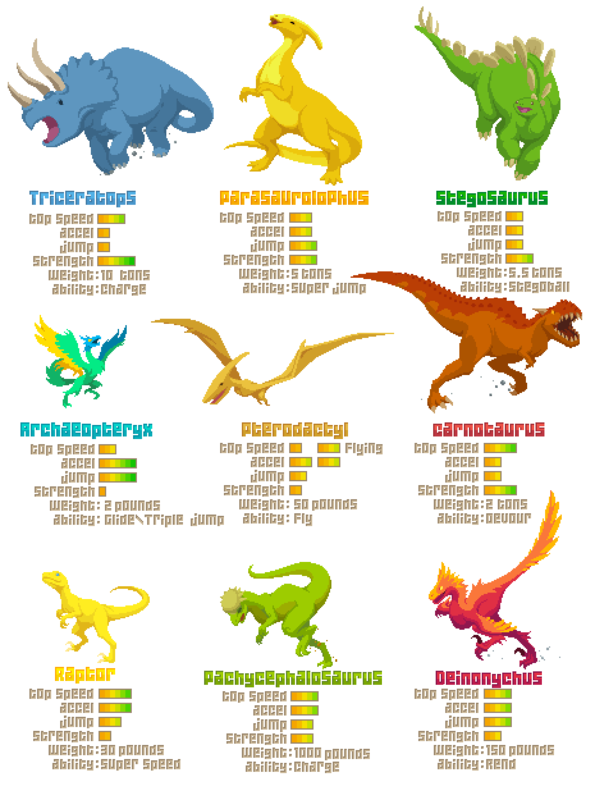 The sequel will have at least 8 dino types with varying skills and special abilities. A WIDE VARIETY OF NPC DINOS: There are bound to be plenty of creatures who are blissfully unaware of their impending doom. They make great scenery as well! Dino Run 2 ramps up the non-playable dinos a considerable amount. NEW TYPES OF DOOM: The original had a single pyroclastic doom wall that never changed. Dino Run 2 will have avalanches, lava flows, floods... if it can kill millions of lifeforms in a few hours, we'll probably put it in there. CUSTOMIZATIONS GALORE: With new playable dino types come new ways to make them your own! Scarves, shoes, hats, sweaters, color patterns and of course, other dino heads. MULTIPLAYER TRIBES: With new playable dino types come new ways to race against your friends. Join a tribe, initiate realtime races and climb to the top of the leaderboards! Pixeljam has made over 20 games in the past 12 years. One important lesson we've learned is that most game crowdfunding campaigns fail to deliver because the developers don't fully understand the risks involved or get blinded by their own hype. We've been there, and don't want to do that again. We are raising funds and creating the game in carefully planned stages. In October 2017 we started STAGE 1 and crowdsourced a small amount of funding (about $10K) from the existing community. This funded upgrades to our campaign platform (pixeljam.com/dinorun and dinorun2.com), which documents the entire development and fundraising process. It also funded pre-production research, additional concept art and some initial prototypes in Unity. This Kickstarter campaign is STAGE 2, in which we raise more money (20K minimum, but ideally 65K) to create a significant portion of Dino Run 2 and deliver the process of making it to all backers. What we will deliver includes artwork, playable physics tests, livestreaming events, animation experiments, coding and audio jams, and most importantly DINO-THEMED MINI-GAMES. This Kickstarter is a single event in the larger campaign to create the full game. We raised money before it, and will do so after it as well. We will do this through Drip (Kickstarter's new subscription platform), Patreon (this is already feeding the campaign $500/month), direct funding through our own site (10K raised so far), and partnerships with publishers & spin-off game licensors (we are already in preliminary talks with multiple potential partners). After we create a single playable era, we will re-assess the campaign and see what the best option is to get to full release. It will most likely be a combination of partnerships, more direct crowdfunding on our own site or perhaps another Kickstarter, early access on Itch.io and Steam... all the various revenue streams that add up and get us to the finish line. 30K - DINOSTREAM UPGRADE & BONE CURRENCY: The DinoStream at dinorun2.com is the best way to see what's up with Dino Run development at any given time. Right now it's in an alpha state and needs significant upgrades to its navigation and interactivity. Also at the 30K backing level, we'll implement a dino currency called BONES that all backers, supporters and fans will get. People that contributed real money (like backers) will get the most, but you can also "mine" bones by promoting our campaigns, filling out dino-related surveys AND by "cashing out" your supply in the original Dino Run DX. Bones are the official currency of the Dino Run 2 ecosystem, and will be used for anything and everything you can do in there - trading hats, leaving your mark on the DinoStream, or applying them to real-money discounts on T-shirts, posters and other eventual merchandise. Despite having in-game currency, DINO RUN 2 is not a Free-To-Play Game. Bones have always existed in Dino Run, and the plan is to make them much more useful than just unlocking levels. 40K - STEGOBALLS! A small stegosaurus-rolling game, for Mac, Windows and Linux. Get to the bottom of the hill as fast possible! Please note: all rewards marked as "guaranteed" are given even if the project doesn't meet its goal. That means you get it just for pledging. Dino Run DX (guaranteed) - everyone at the 5$+ backing level will get a Steam Key for the original Dino Run that they can play right now - a single & multiplayer prehistoric platformer that is (obviously) the main inspiration for the sequel we are currently working on. Prototypes, Concept Art, Mini-Games - everyone at the $5+ backing level will get access to all art, music, prototypes, alphas and small spin-off games we create during the development process. Dino Run 2 Game (MAC / WINDOWS / LINUX) - everyone at the 10$+ backing level will get the final game, which will be as large as the funds we raise over the entire development lifecycle allow. If we raise 80K overall, we will deliver a very small Dino Run 2. If we raise much more, we deliver a much larger version. Discord Server Access (guaranteed) - at $15+, you get access to the backer-only channels of our very active discord server and join the conversation with fellow players, and the devs making Dino Run 2. You also get your choice of 1 Pixeljam game besides Dino Run DX (see the choices below in the 35$ tier). Monthly Treats - for $25+ you will get access to our treat directory which contains a plethora of Pixeljam-related digital goodies, including prototypes of older games, unreleased games (some are nearly completed! ), soundtracks, etc. We add 1-2 treats per month and will be for as long as we are working on Dino Run 2. Preview the current treats here. Pixeljam Collection (guaranteed) - $35+ backers get all of our existing games and soundtracks, delivered right after the campaign ends. Includes Dino Run DX, Potatoman Seeks The Troof, Glorkian Warrior, Last Horizon, Snowball, Gamma Bros and Cheap Golf. Dino Run T-Shirt - 60$+ backers get a high quality screen-printed T-shirt that comes in 2 styles and about 10 colors. This will be ordered, printed and shipped within a few months after the Kickstarter campaign ends. Small Land Tract - $100+ backers get to design a small land tract, which means you choose the content of a small "terrain chunk" that will be randomly placed in various game levels. You can choose the type of terrain, a few features (like "steep drop" or "big hill" or "pond / oasis"), a small stationary dino to inhabit it, and even a little stone with your initials or symbol on it to show the world it's yours! You'll also get a wallpaper / background version for your own use. Large Land Tract - $250+ backers get to design a large land tract, which is like the small one, but... much larger! You can choose the type of terrain, a few land features, and a large stationary dino of your choosing (or a few small ones), and a little stone with your initials or symbol on it. Like the small one, you will also receive a wallpaper / background version of it. Miles : Design, Production, Campaign Management. He makes sure all is running smoothly, the books are balanced, the design docs are tight, and most importantly that the devs, backers, fans, and players are happy. Rich : QA / Design. Rich is the creator of the Dino Run world. He did the artwork for the original and will provide design and quality assurance for the sequel. Jeffrey : Design, Art, Animation. He brings the dinos to life and gives them a world that seems hell-bent on killing them all. Rand : Programming. He tells the computer what to do, and it almost always obeys. Mark : Music. Mark lays the beats, notes and bones that make Dino Run sound like it should. Will : Business Management. Will helps turn the process knobs to make sure the business end is well-tuned. The road to make a game of this size and quality is long and hard. Without the proper plan, community support and team, things quickly fall apart. We've done a lot of work to ensure that we move towards our final goal with efficiency and safety. Dino Run has been around for more than 10 years and has a solid community of fans, players, moderators and multiplayer "prestige" racers that you will become part of when you back this project. It's more than just a game. We listen to our fans, a lot. We talk to them almost every day and they influence the direction of development, even if they aren't aware of it. Backing this project makes you one of those people whose voice will be heard, should you decide to speak up! It's somewhat risky if you back the project expecting an enormous final game. Since this campaign is only the first step of a multi-step funding and development process, it's possible that we might not make it to the other steps and have to make major cuts in game scope. We have a lot of momentum and community support behinds us, as well as multiple revenue streams contributing to development... but anything is possible, and sometimes plans don't work out the way they should. Not risky: you understand what you are backing, you accept that you will only get what we can raise money for, you back at the level you are comfortable at, and you keep up with our progress and collect all the goodies that we produce along the way. Drop a dollar in the tip jar and get access to our backer-only updates. You don't get access to anything else, but you DO get a big virtual dino hug for contributing. This gets you access to everything we deliver while making the game up to a single playable level (vertical slice), but NOT THE FULL FINAL GAME. In other words, you WILL get concept art, playable physics tests, minigames, prototypes, experiments, digital treats, music and anything else we make during the exploratory phase of the project, but you won't get the final game. Bonus - you also get 1 Steam key for our original game DINO RUN DX, delivered right after this initial campaign ends. Dino Run DX is GUARANTEED - you get it just for pledging, even if the campaign doesn't meet its funding goal. You get the FULL GAME for Mac, Windows and Linux, the scope of which depends on how much we raise over the project lifecycle. For more clarification, read the full story on the left. All above rewards and access to the backers-only channels of our Discord server, where we will spill even more beans about process and progress. Discord access is GUARANTEED - you get it just for pledging. Access to our TREATS COLLECTION, an ever-growing directory of Pixeljam-related digital goodies including prototypes, unfinished or rare games, bonus soundtracks and more. Visit http://dinorun2.com/treats/ for a preview of the current treats. New ones are added once or twice a month. These will all be delivered right after the campaign ends. This reward is GUARANTEED - you get it just for pledging, even if the campaign doesn't meet its funding goal. This gets you everything above and a high quality screen-printed Dino Run T-shirt, delivered a couple months after the campaign ends. Design a small "land tract" to be used in the game. Name a few elements for us to use (terrain features, small stationary dinos) and we'll create the scene for you, and put it in the game as well. See the story to left for acceptable items to request. Design a large "land tract" to be used in the game. Name some elements (terrain features, stationary dinos) for us to use and we'll create the scene for you, and put it in the game as well. See the story to left for acceptable items to request.